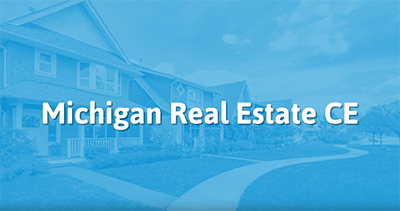 This is an 18 hour package of continuing education content designed for real estate professionals in the State of Michigan. This course will begin with an overview of recent updates to State law. This course will also cover supervision and management of employees, professional codes of ethics, errors and omissions, mortgage disclosures, contract law, and financial records and reports. It's easy to use and great content. This was an excellent and thorough refresher on contract law. Furthermore, it allowed me to catch up with continuing education on a busy schedule. The class was amazing and easy to follow and fun! sure. I would like to receive reminder email each year for 6 hour continuing ed. Great course, has all the information, and very simple and quick to complete! Great class with Great information! The classes covered significant relevant material. The format was understandable and user-friendly. I was pleased with this course especially since this is the first time I used this company for CE. Course was clear and easy to use. I would like to print the course for my personal reference..
Good format, would use this company again. Well organized and quality content. Easy to navigate web site. The content was relevant and the course was efficient. Very informative, easy to navigate through each module. The course was very informative and a greater refresher for updated as well as forgotten information. I found this class easy to access through my various devises...ie, iPhone & MacPro. Well done and enjoyed it. The course is well organized and user friendly. I love the simplicity of the course and it was very knowledgable for me. I TOOK MY PRE-LICENSURE CLASSES WITH YOUR COMPANY AS WELL. I AM VERY SATISFIED AND WILL CONTINUE TO USE YOUR SITE FOR FUTURE CE'S. THANK YOU. Better instructions at the start would be good but other than that it was pretty straightforward. Loved it. Learned you can actually counter with a counter even though its considered a rejection. It would be great if there was an audio version. Slides could be less wordy and more concise/bullet pointed. Excess verbiage makes it visually distracting. Also, clarify up front this is not state specific as I was under the impression it was.